Macie Bricker is this year’s President. Macie is a Senior and a 4 year FFA member. She was a 4-H member for 10 years, and has shown goats and pigs. Macie is a member of the Dive Team, soils, and parliamentary procedure team . Morgan Vogt is this year's Vice President. She is a senior, at Shelby High School and a 4 year FFA member. Morgan has shown hogs at The Richland County Fair. She is a member of the SHS cross country team. Faith Gosser is this years Vice President. Faith is a senior, at Shelby High School and a 4 year member of the Shelby FFA. Faith has shown cows at the Richland County Fair. She is also a member of the Shelby cross country team. Kourtney Vanwagner is this year's Secretary. Kourtney has shown goats and rabbits at the Richland County Fair. She is also a member of the basketball team. Kourtney is a Junior at Shelby and a 3 year FFA member. Seth Wasilewski is this year's Treasurer. Seth is a junior and a 3 year FFA member. Seth is a member of the parliamentary procedure team, and he is on the baseball and swim team. Chloe Bricker is this year’s Reporter. Chloe is a junior, a 3 year member of the FFA and a 10 year 4-H member. She has shown goats at the Richland county fair. Chloe is a member of the Shelby dive team. Blake Lucius is this year's Student Advisor. Blake is a junior at Shelby High School. He is a 2 year member of the Shelby FFA. He shows goats at the county fair. He participates in parliamentary procedure and is on the Shelby cross country team. Kendall Adkinson is this year's Sentinel. He is a senior and a 4 year member of the FFA. Kendall participates in the wildlife contest and parliamentary procedure. Marissa Lynch is this years Historian. She is on the Cross Country team as well as track team. 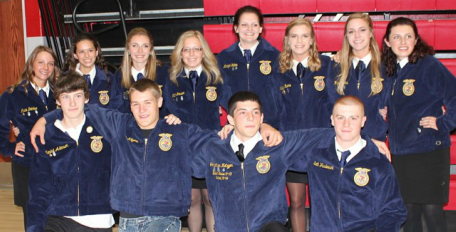 Marissa is a 3 year member of the FFA. Josh Campbell is this year's Parliamentarian. He is a senior and a 4 year member of the FFA. Thomas Johnson is this years Chaplain. Thomas is a sophomore at Shelby High School and first year FFA member.